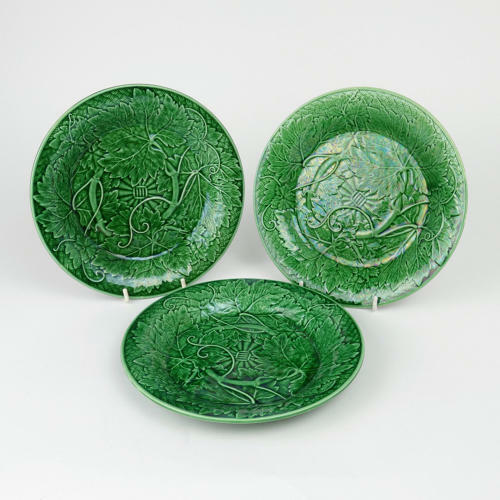 A group of three Wedgwood, green majolica glazed plates. These plates are moulded with grapes and vine leaves on a basketweave background. This is then covered in a green, majolica glaze. Each one is marked with an impressed 'WEDGWOOD' mark and the number '7'. They date from c.1870 and they are all in excellent condition. Although they are shown as a group of three we are selling them individually. There are only 2 left. Price includes postage within the U.K. Shipping to the U.S.A. add £15. Western Europe add £10.